Chargrilled burger, topped with lettuce, tomato, pickles and onions. Like our cheeseburger, topped with Applewood smoked bacon. We roast fresh poblano peppers on our char-grill (it sounds like a campfire), then cut them into slices to grace this burger. Also covered with our special poblano sauce, pepperjack cheese, lettuce, tomato, pickles and onions. It’s like jalapeno poppers on a burger, but better! Cream cheese with two kinds of pickled peppers and spices make this one delicious burger. About a 3.0 out of 10 on the heat. Yes, it is what you think it is. Natural peanut butter spread on the top and bottom bun, the Applewood smoked bacon buried in the PB. Topped with lettuce and tomato. There’s this wonderful little goat dairy up in Honoka’a that produces the smoothest goat cheese you’ve ever tasted. Then, they blend macadamia nut pesto into it. We spread the result of this happy combination on the top AND bottom buns. Topped with lettuce and tomato. Our Gardenburger patty with provolone cheese, marinara sauce, lettuce and tomato. Note that we will gladly substitute a Gardenburger patty on any other burger for $1. We never know what fresh fish we can get (and what we’re charged for it), and we’re not about to freeze any, so we can’t say on our menu what we’re serving today. It will be perfectly char-grilled, and served simply with just lettuce, tomato, and mayonnaise. This sandwich is a religion in certain parts of the country. We slice a pork loin into cutlets, pummel them with tenderizing mallets, marinate them for at least four hours in our secret recipe marinade, bread them, fry them, then serve them with lettuce, tomato, pickles and onions. Oregano marinated chicken breast, char-grilled and served with pepperjack cheese, lettuce, tomato, pickles, onions, and mayonnaise. Oregano marinated chicken breast, char-grilled and topped with provolone cheese, lettuce, tomato, and delicious pesto sauce spread on each bun. Slow roasted kalua pork, grilled diced onion, BBQ sauce, and topped off with our house-made pineapple coleslaw. Slow roasted kalua pork, egg, Swiss cheese, topped off with our Big Island Pepper Company based sauce. A 6” natural casing frank, seasoned to perfection, char-grilled and served on a steamed poppy seed bun with dill pickle spear, sport peppers, diced onions, tomato wedges, sweet pickle relish, and our house-ground celery salt. It’s up to you whether you put mustard and/or ketchup on it. We’re staying out of it. Our 6” natural casing Vienna Beef frank on a Punalu’u guava sweetbread hot dog bun, with a dill pickle spear, sport peppers, citrus pickled red onions, and our special lilikoi/mustard sauce. Our 6” natural casing Vienna Beef frank on a steamed poppy seed hot dog bun, with a dill pickle spear, sport peppers, onions, and our spicy Hot Mess sauce. Three half strips of heavenly bacon! If you don't like the cheese that comes on your sandwich, just tell us what you'd prefer! We offer Tillamook Medium Cheddar, Provolone, Pepper-Jack, and Swiss. 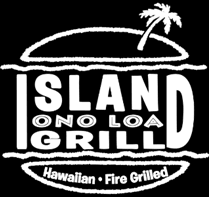 The Hawaiian classic with two hamburger patties and two eggs plus brown gravy, but made Island Ono Loa Grill better because we char-grill our hamburger patties. Two char-grilled hamburger patties plus brown gravy, topped with grilled onions. Our slow cooked kalua pork. Gravy. Good. We thick cut our potatoes daily, leaving the skin on, cook them twice, and season them just before we serve them to you. Thinly sliced daily and lightly coated in our seasoned batter just before we cook them. House made coleslaw with pieces of ripe Hawaiian grown pineapple. Green leaf lettuce, carrots, cucumbers, citrus pickled red onions, our special Asian vinaigrette dressing, with today’s fish char-grilled to perfection. Everything in this big salad is grown on the Big Island. Green leaf lettuce, avocado, papaya, macadamia nuts, and of course, the smooth macadamia nut goat cheese of Hawaii Island Goat Dairy. Lots of it. Green leaf lettuce, carrots, cucumbers, citrus pickled red onions, and our special balsamic vinaigrette dressing. Melted cheese in a hamburger bun. Not fancy, but kids like grilled cheese! So good even adults like them!